The ASEM Rectors’ Conference and Students’ Forum (ARC) is a bi-annual conference series that has been recognised as an Official Dialogue Partner of the ASEM Education Ministers’ Meeting (ASEM ME). The past editions of ARC have brought together hundreds of Asian and European student, university and business leaders for solution-oriented discussions on emerging higher education issues concerning both regions. ARC is also one of the initial commitments to the Global Action Programme on Education for Sustainable Development (ESD), which is the successor to the United Nations Decade of ESD (2005-2014). Themed “Employability: Asia and Europe Prepare the New Generation”, the 5th ASEM Rectors’ Conference and Students’ Forum (ARC5) focused on employability skills. With increased demands from the labour market, young people need to be equipped with a more flexible, innovative and specialist skillset. Cooperation between universities and businesses can provide students with the necessary skills and competences, and help them better prepare for the labour market. The significance of the topic of youth employment and employability skills is emphasised by the importance put on it by the policy makers in Asia and Europe. At the 5th ASEM Education Ministers’ Meeting (ASEM ME5) the need for “HEIs and entrepreneurs […] to collaborate closely at different levels and formats in order to improve employability of graduates, to cultivate entrepreneurship, and to innovate learning environment through information and communication technologies” was stressed. The Ministers also stated that employability of students needs to be improved “through work placements and work-based learning and to embed those instruments in the curriculum.” Furthermore, the topic of employability corresponds with the United Nations’ (UN’s) Sustainable Development Goals to substantially increase the number of youth and adults with access to quality tertiary education and relevant technical and vocational skills for employment. ARC5 consisted of plenary and working group sessions, all under the theme of employability. In addition, there were special sessions for networking between rectors, students and businesses through unconventional concepts such as a human library. An Online Preparatory Phase was held prior to the Students’ Forum for in-depth preparation and understanding of the selected topic. To ensure close linkages between the Rectors’ Conference and the Students’ Forum, 4 Rectors attended the Students’ Forum as Mentors to the design sessions, and 4 student participants participated in the Rectors’ Conference to report on the outcome of the Students’ Forum. The themes of ARC were: “Between Tradition and Reform: Universities in Asia and Europe” (ARC1); “Asia-Europe University Cooperation: Contributing to the Global Knowledge Society” (ARC2); “Universities, Businesses and You: For a Sustainable Future” (ARC3); and “University-Business Partnerships: Asia and Europe Seeking 21st Century Solutions” (ARC4). “Conclusions by the Chair,” 5th ASEM Education Ministers’ Meeting (ASEM ME5) (27-28 April 2015, Riga, Latvia): 5, http://www.aseminfoboard.org/sites/default/files/documents/2015%20-%20ASEMME5%20-%20Chair%20Conclusions.pdf. On 9-10 November 2016, the Ministry of Education of the Republic of Korea hosted the 1st ASEM Education Senior Officials' Meeting (SOM) in Seoul, Korea, in preparation for the 6th ASEM Education Ministers' Meeting (ASEM ME6). Following the ASEM Intermediate Senior Officials' Meeting on Education (ASEM ME6 ISOM) in Moscow, the Russian Federation, on 13-14 April 2016, this meeting focused on the topic of “Collaboration for the Next Decade: From Common Perspectives to Effective Fulfilment”. The 53 ASEM partners were invited to contribute to discussions on how best to collaborate effectively when responding to the challenges and opportunities during the coming decade. In doing so, ASEM partners and stakeholders deliberated on how to cooperate and support the 4 priority areas of the ASEM Education Process: quality assurance and recognition; engaging business and industry in education; balanced mobility; lifelong learning including technical and vocational training. ASEF presented its achievements over the past year, emphasising its focus on entrepreneurship and youth employment under projects in the ASEF Education Policy Programme and the ASEF Young Leaders Programme. The presentation highlighted ASEF’s contribution to ASEM ME6, most notably, through the 5th ASEM Rectors’ Conference and Students’ Forum (ARC5), which is an Official Dialogue Partner of the ASEM Education Ministers’ Meeting. During this ASEF project, the ARC5 stakeholders developed policy recommendations on youth employment, which were personally received by Professor LEE Young, Vice-Minister of Education of the Republic of Korea. ASEF will continue its engagement in the ASEM Education process ahead of ASEM ME6, and, over the coming years, will focus on the topic of access to education and youth employment. The ASEM Education Intermediate Senior Officials Meeting (ASEM ME6 ISOM) on “Global Connectivity for ASEM Education” took place on 13-14 April 2016 in Moscow, the Russian Federation, where representatives of the 53 ASEM partners shared results and achievements of bi-regional activities within the ASEM Education Process. The meeting served as a preparation in the lead up to the 6th ASEM Education Ministers’ Meeting (ASEM ME6) in 2017 in Korea. On this occasion, the Asia-Europe Foundation (ASEF) presented the outcomes of the recent 5th ASEM Rectors’ Conference and Students’ Forum (ARC5). ARC5 concluded with the development of 2 sets of policy recommendations on employability, created by rectors and students from all 51 ASEM partner countries, during their meeting from 4-8 April 2016 in Prague, the Czech Republic. The policy recommendations represent the perspectives and voices, from civil society to the deliberations of the 6th ASEM Education Ministers’ Meeting (ASEM ME6) in 2017 in Korea. They focus on 3 core areas for cooperation between governments, universities, business and the third sector to enhance employability in Asia and Europe: a) the creation of a continuous multi-stakeholder dialogue; b) the importance of the recognition of work experience in the new economy; and c) on mobility, accessibility and financing. Both the rectors and students also reiterated the recommendations of the 4th ASEM Rectors’ Conference and Students’ Forum (ARC4) held in 2015 in Hangzhou, China. About 200 university leaders, government and business representatives as well as students from all ASEM partners meet on 4-8 April 2016 in Prague, the Czech Republic for the 5th ASEM Rectors’ Conference and Students’ Forum (ARC5) on “Employability: Asia and Europe Prepare the New Generation”. This 5th edition sees the greatest diversity in Asia-Europe representation thus far. With the objective to jointly develop Policy Recommendations for the upcoming 6th ASEM Education Ministers’ Meeting (ASEM ME6) in 2017 in Korea, the participants discuss topics such as the skills gap challenge and rapid changes in the labour market. They also explore the roles, which universities and businesses play alongside governments in better preparing the new generation for their future career. Representing the ASEM ME6 host country, Professor LEE Young, Vice-Minister of Education of the Republic of Korea will receive the Policy Recommendations developed by the different stakeholders over the course of ARC5. ARC5 has attracted keynote speakers from the highest government and business levels including Mr Pavel BÉLOBRÁDEK, Deputy Prime Minister, Science, Research and Innovation of the Czech Republic; HE Dr Lubomír ZAORALEK, Minister for Foreign Affairs of the Czech Republic; Mr Alain DEHAZE, CEO of the Adecco Group; Mr Hun LEE, CEO of Samsung Electronics in the Czech Republic and Slovakia; and Mr Mel CARVILL, Member of the Board of Directors of the Czech company Home Credit, B.V.
ARC5 is co-organised by the Asia-Europe Foundation (ASEF) and Charles University in Prague with the support of the Ministry of Foreign Affairs and the Ministry of Education, Youth and Sports of the Czech Republic. Home Credit B.V., Samsung, the International Association of Universities, the ASEAN University Network, the European Students’ Union and the Erasmus Student Network contribute as supporters. Together with ASEF, Charles University in Prague, the Czech Republic, will organise the 5th ASEM Rectors’ Conference and Students’ Forum (ARC5): Employability: Asia and Europe Prepare the New Generation on 4-8 April 2016. ASEF interviewed Professor Tomáš ZIMA, M.D, DSc., the Rector of Charles University in Prague, about his views on this project. Q. As the host university of the 5th ASEM Rectors’ Conference and Students’ Forum, what is the value and impact of this platform? The ASEM platform is not only a unique opportunity for Asian and European academic institutions to exchange contacts and enhance cooperation in the field of education and science but also enhances interaction with other sectors, namely business, technological and research institutions. The Charles University in Prague has a strong cooperation in the Asian region with Chinese and Korean universities and institutes. However we welcome the possibility to explore other areas for cooperation in different regions. This platform brings together prominent representatives from the academic sector, high level representatives from public sector and business representatives from Asia and Europe. These 2 events present a fantastic opportunity to discuss crucial topics of today’s world: How to prepare the new generation for employment in our rapidly changing environment and what can we do for it. Q. The topic of the 5th ASEM Rectors’ Conference and Students’ Forum is “Employability of the New Generation”. Where do you think is the role of HEIs in enhancing the employability of their graduates and what are Charles University in Prague’s strategies? I am convinced that besides the chosen area of studies whether it is medical profession, human or natural sciences, we need to enhance also soft skills such as communication skills, presentations in foreign languages, techniques of speech and time management, and at the same time explore new skills. We need to further support interaction between nature and humanities, science and technical studies, sharing unique technologies, interdisciplinary exchange of experience and approaches. International cooperation is one of the key elements to increase employability. Students must be exposed to different countries and environments, which will increase their future perspectives. At the Charles University in Prague we see international cooperation as one of the key priorities, which is set in the long-term strategic plan 2016-2020 of the university. At the moment we have about 200 bilateral agreements on cooperation with universities world-wide. We are using different bilateral, national, European and international programmes to support student and academic exchanges including the Erasmus programme (within Erasmus+ we receive annually more than 1,400 students from abroad and about 1,100 Charles University in Prague students travel to different countries). Besides that we also offer over 170 programmes in foreign languages at our faculties (Charles University in Prague has 17 faculties). Q. What is your personal advice to fresh graduates when looking for and also starting their first job? I believe that fresh graduates should “think out of the box”, be imaginative and not be afraid of new ideas and approaches. They need to be familiar with foreign languages too, that is a necessity today. At the same time they should be humble and accept that they need to start at the bottom, not expecting that the dream of a well-paid job will come straight away. Q.The Asia-Europe Meeting (ASEM) Process, which currently consists of 53 partners representing Asia and Europe celebrates its 20th Anniversary this year. In your opinion, what are the priorities of future cooperation in higher education between both regions? It is important to further facilitate exchange of students and professors in order to acquire better understanding of the cultural, historical, economic and political profile of both regions. We need to enhance involvement of research staff and students in international research projects. From an academic point of view it is also necessary to further develop international programmes. Last but not least there needs to be an interaction between education and private sector. It will be even more important than before to keep learning about each other. We need to focus on building bridges across different sectors between our regions to ensure a better and sustainable future. How can governments cooperate to tackle the challenge of rising youth unemployment in Asia and Europe? What can universities do to better prepare young people for the labour market? How can universities and businesses work together to prepare the new generation for their careers? The 5th ASEM Rectors’ Conference and Students’ Forum (ARC5) on "Employability: Asia and Europe Prepare the New Generation" will address these questions. It will take place between 4-8 April 2016 at Charles University in Prague, the Czech Republic. ASEF warmly invites students of all academic disciplines to contribute to and develop answers to fill the skills gap between education and job requirements. Apply and join your peers from 51 ASEM countries to represent and communicate the students’ voice in the ASEM Education Process. A stimulating and dynamic programme awaits you: interact with university rectors, business leaders and policy-makers and channel your perspectives directly to the ASEM Ministers for Education. Travel subsidies, accommodation and meals are provided for the participants. Interested? Take a look at the results and impact of the previous Rectors’ Conference and Students’ Forum on 23-27 March 2015 in Hangzhou, China. Make use of this unique opportunity and have a say in the future of youth employment in Asia and Europe! After the 4th edition of ASEM’s Rectors’ Conference and Students’ Forum (ARC4) at Zhejiang University in Hangzhou, China, we are getting prepared for the next chapter in Europe. 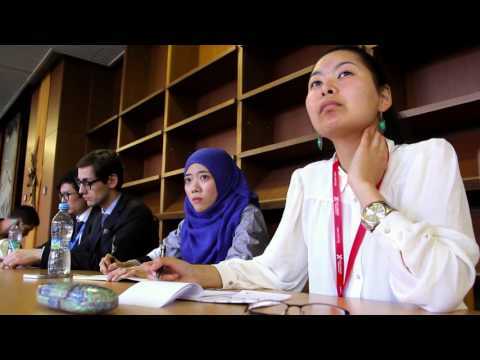 Hosted by Charles University in Prague, in partnership with the Ministry of Foreign Affairs and the Ministry of Education of the Czech Republic, the 5th ASEM Rectors Conference and Students’ Forum (ARC5) will take place 4-8 April 2016 in Prague, the Czech Republic. Mark the dates in your calendar! Participation in the Rectors’ Conference is by invitation only. Students will be selected through an Open Call.